Finally, there is no need to second guess your sample-peak limiter time and time again, or deliberately increase headroom to avoid a downstream problem. Now you can simply dial in your True-peak limit and let ISL take care of the rest. ISL uses the standardised True-Peak algorithms of ITU-R B.S. 1770 and related standards and is suitable for the control of audio for Post Production and Broadcast applications. 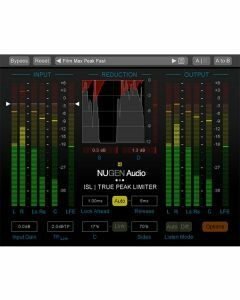 True Peak limiting can also be used to ensure that down-stream Codecs (mp3, AAC etc.) do not introduce distortion into the signal.